We manufacture world class carbon and graphite thrust bearings that are extremely durable and have diverse industrial usage. The Carbon thrust bearings and pads that we offer have enhanced strength as they offer excellent resistance against heat and pressure. These carbon & graphite thrust bearings have non reactive properties which is why they are constantly in demand for various mechanical purposes in the industry. We also consider clientsâ�� requirements before the production of our products. And it is our hard work and unshrinking commitment to quality that has made us one of the leading carbon thrust bearings manufacturers in India. 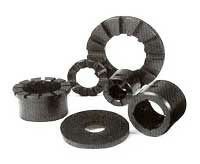 We are also acknowledged as the top graphite thrust bearings exporter in the country.